For Christmas, my spouse’s grandmother gave me her 1929 Underwood No. 5 Typewriter. She had kept it under a plastic cover for decades, and while it’s not in pristine condition, it is still a thing of simplistic, utilitarian beauty. What I love most about this typewriter is that there is nothing superfluous about it. Every key, every lever, every piece of metal has a purpose. No bells and whistles, except, of course, for the bell that alerts you that you’re close to the margin. There is no key for the number “1”, and why should there be; use a lower-case “L” instead. Need an exclamation mark? Are you sure? Well, then, you’ll have to use an apostrophe (that’s Shift-8), then backspace, then use a period. You really have to work for it, as though Underwood doubted whether anyone really should be using exclamation marks. The same thing for the shift lock; you have to apply a remarkable degree of force to lock into full-capitalization mode, which might make you think twice about doing so. If only bloggers and undergraduates were subject to such rigors. I also love the economy of this typewriter: there are keys for 1/4, 1/2, and 3/4 and cents. It says something, perhaps, about the time of this typewriter’s manufacture: when exclamation marks and capital letters were less important than keeping track of 3/4 of a cent. I’m not sure if the Underwood company built this particular No. 5 before or after October 29, 1929, but for me it symbolizes the austerity of the days and months and years that followed Black Tuesday–a little piece of the Great Depression sitting on my desk, reminding me that I really am a lazy cuss. What a great little essay. I tend to look at old machines with a sense of how cutting-edge they were in their day, how people gazed upon them with the same greedy appreciation for form and function that we now bestow on the latest smartphone (and that will seem equally quaint to our descendants). 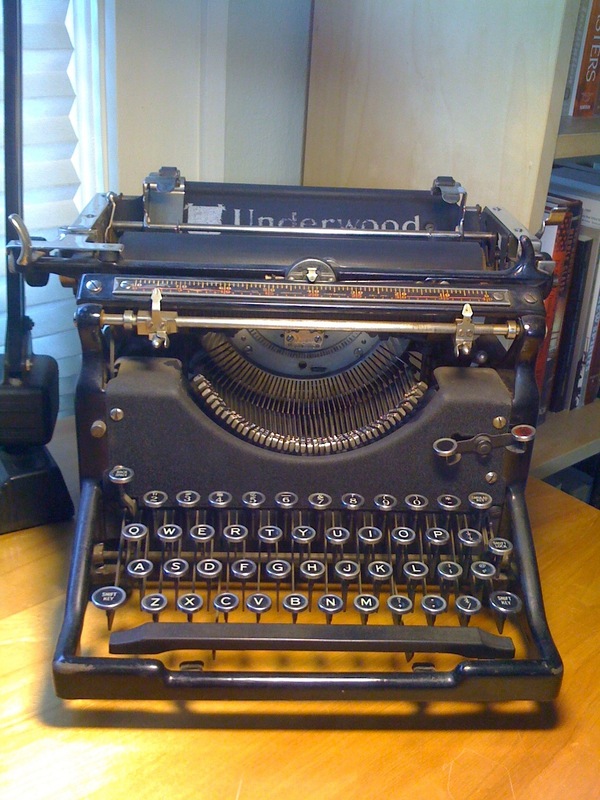 Your observations on what is easy and what is hard to do with an Underwood had not occurred to me. Dunno that typists in the ’20s and ’30s were likely to keep track of fractions of cents — maybe dollars and other measures — but your point still stands. Thanks for the compliment, Alarob. You’re probably right about the fractions of a cent, but I just couldn’t help myself: I imagine my spouse’s grandmother doing the family budget, setting aside 3/4 of a cent per day for the electric bill (or some other equally unlikely scenario). Ah, the romance of a time when no one had money…. Thanks for your small text! It enlightened me on how to type a number “1” and an “exclamation mark” on my Underwood No. 5 from 1947 which I proudly acquired at the flea market recently. It’s fun to write on those and to actually understand the technique behind it! Glad you liked the essay, Dan, and congratulations on your “new” typewriter!